The pair volunteers at the shelter at least 3 days a week. Some days you will find them greeting guests and passing out drinks during lunch. Other days they will organize and sort donations in the commissary. One thing is for sure – Derek’s smile is contagious. He brings energy and compassion to melt your heart. Thank you, Derek & Fred, we’re truly lucky to have them! He’s a regular in the kitchen and has a true passion for serving others. “It’s an easy way to show the men the community cares about them,” Larry said. Years ago, he delivered clothing to the shelter with his church and he was hooked. 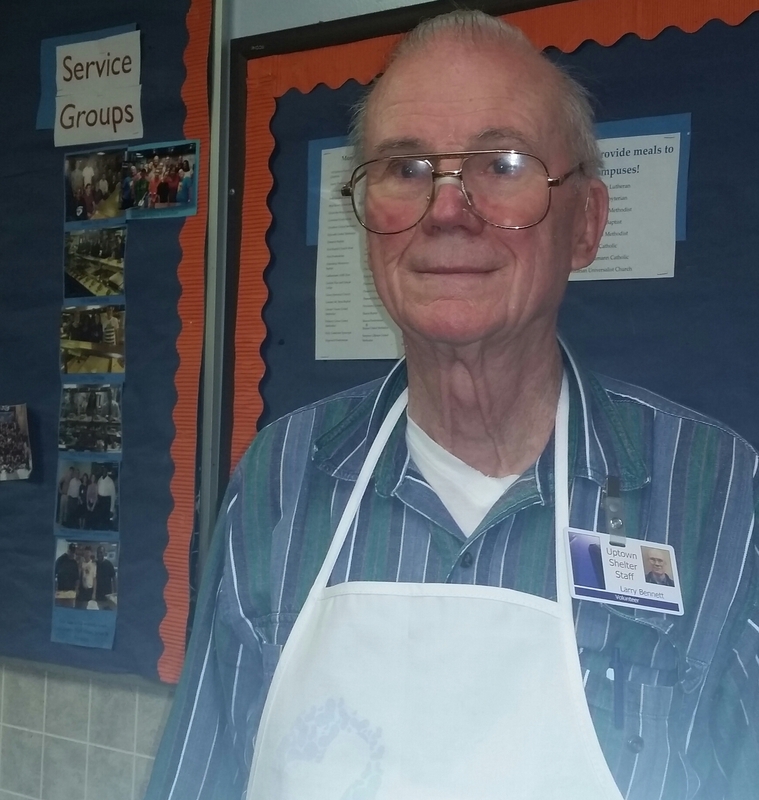 Larry began helping his church with meals and soon took over leading monthly meal service for the Unitarian Universalist Church of Charlotte. When he retired about 6 years ago, Larry made an even bigger commitment to serving at Men’s Shelter of Charlotte. He volunteers 1-2 times each week in the kitchen. 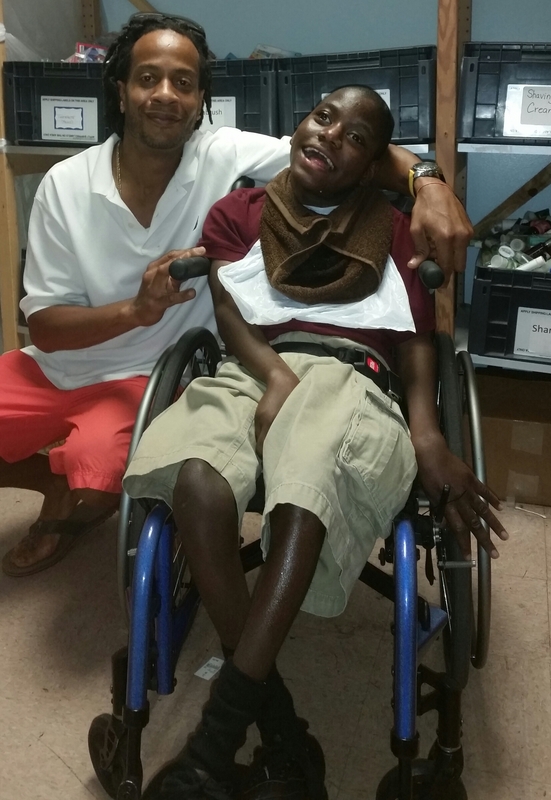 Our kitchen manager, Bob Breed, said Larry will do anything to help and often comes to the rescue! “Its days when we’re shorthanded just before lunchtime – we’re scrambling to get ready and Larry appears. He pitches in and lends a hand wherever we need it, and everything goes smoothly after that,” Breed said. Larry says he enjoys working with the other volunteers and being there to encourage the men. 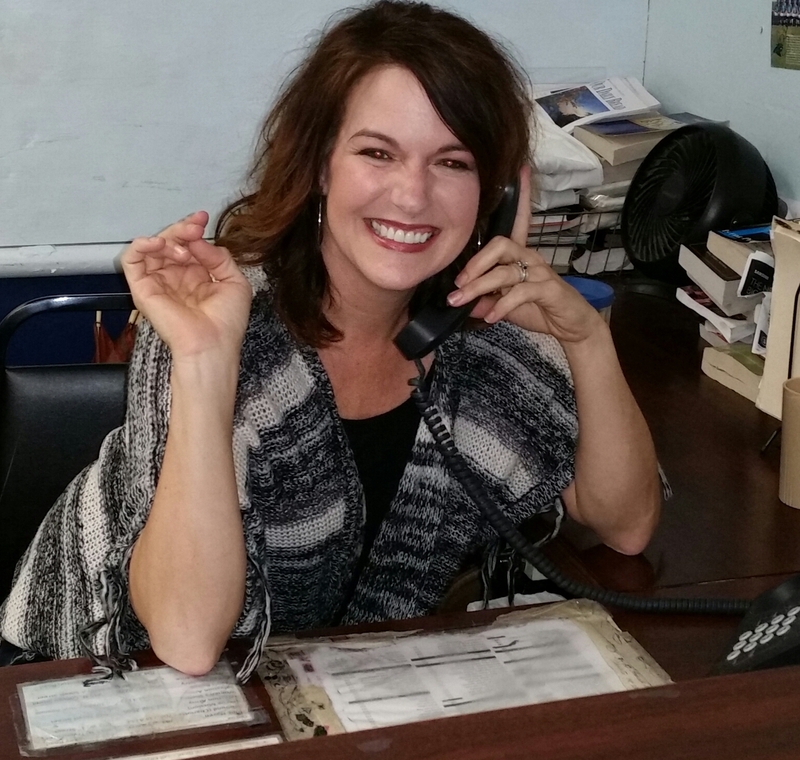 Every Monday night you will find her warm smile greeting clients and volunteers at the front desk. Jacqui has been a regular on the desk for 8 years! She said the best part about volunteering is interacting with the men and supporting their lives. “I look forward each Monday to finding out if a guy got the job he interviewed for last week, and if that guy is doing well after his surgery. I just really care about them,” she said. When asked why she keeps coming back, Jacqui said the shelter is in her blood. Group is one of ten to receive the award. St. Matthew Catholic Church was honored with the Governor’s Award for Volunteer Service during a breakfast celebration on Tuesday, April 14th. This year marks the 37th anniversary of the program that showcases North Carolina’s most dedicated volunteers. For over 30 years, St. Matthew has provided meal services – critical to the stability and well-being of our clients. But their support doesn’t stop there. The Men’s Shelter of Charlotte Ministry team, led by Tom Ellis, exemplifies “best practices” and always finds ways to adapt to changing needs at the shelter. In 2013, St. Matthew became the first congregation to support the Housing & Employment Resource Center (HERC). The team consists of 10-12 volunteers who regularly rotate their service on Wednesday evenings to support our clients with job and housing searches. Volunteers from the church provide weekly support in the commissary to pass out toiletries and clothing. The church also has 4 separate meal service groups that provide lunch or dinner on a monthly or quarterly basis. Aside from volunteering, St. Matthew also has a commitment to providing basic necessities for the men. All church members are invited to get involved through quarterly drives for socks, underwear and t-shirts. Last year, the group donated more than 12,000 items! 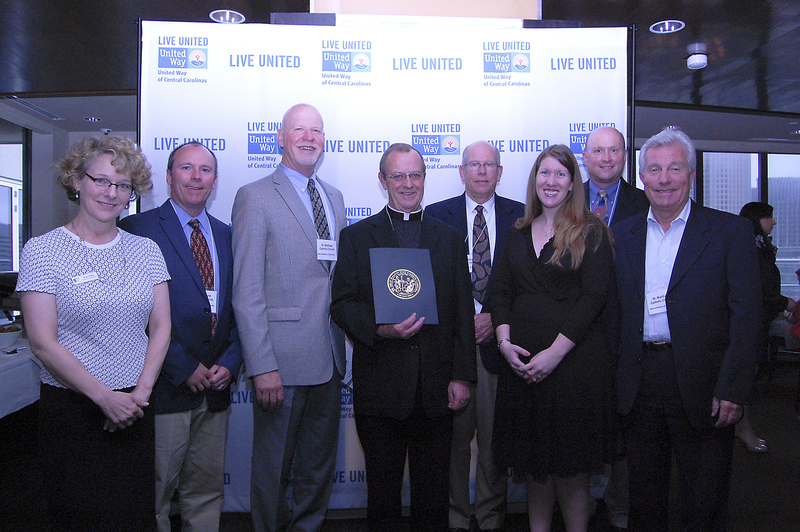 St. Matthew was one of 10 recipients to receive the Governor’s Volunteer Service Award. It honors the true spirit of volunteerism by recognizing individuals, groups and businesses that make a significant contribution to their community through volunteer service. 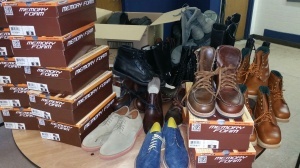 Hundreds of men received new shoes thanks to a generous donation from a local business. 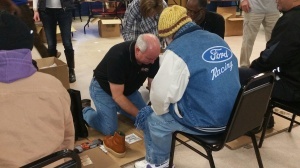 Morgan’s Shoes and Bootery in Gastonia distributed dozens of works boots and casual shoes to men who live at the Tryon and Statesville Avenue shelters. 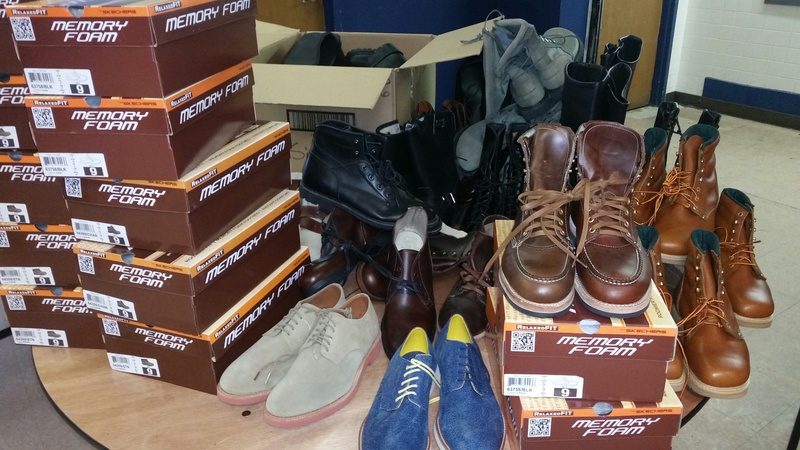 The owner, Doug Morgan and seven of his associates fitted the men. They were then able to choose from several styles in their size and also received a new pair of socks. Morgan placed a special order for the shoes. He made sure to get quality boots that will keep their feet warm all winter. “It’s not leftovers. You want to give a gift worth giving,” Morgan said. One man who is searching for a job said the gift gave him encouragement to keep looking and to keep his head up. “God has blessed us beyond belief. We are just a conduit – he uses us to pass it on and bless others,” Morgan said. It’s the fourth year for the shoe giveaway and Morgan plans to continue the tradition next year.